President Tommy E. Remengesau, Jr. has accredited the third non-resident Ambassador of Slovakia to the Republic of Palau with station in Tokyo, Japan. On January 28, President Remengesau accepted the letter of credence from H.E. Marian Tomasik during the official presentation of credentials ceremony held at the National Capitol in Ngerulmud, Melekeok. President Remengesau extended his congratulations to Ambassador Tomasik and expressed the Republic’s desires for future opportunities to explore areas of cooperation, including education and technology. He further expressed desires to “gain better knowledge and understanding of each other’s cultures and issues” as citizens of the world. 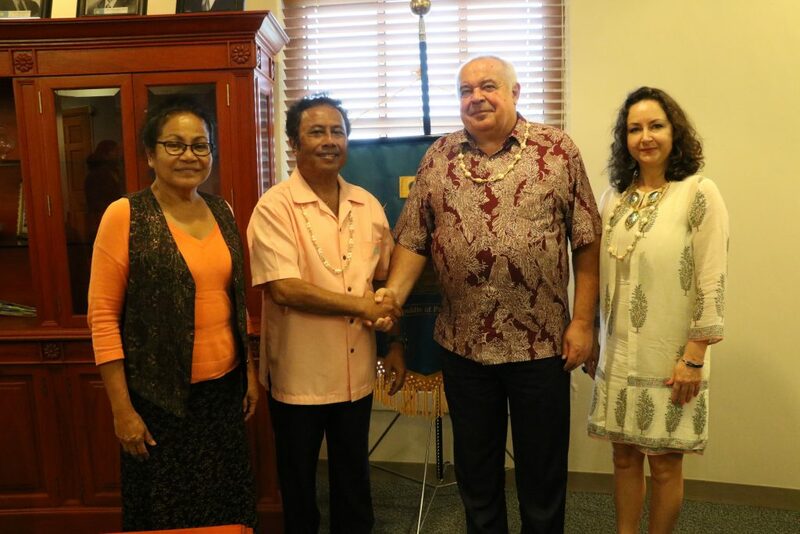 Expressing his pride and honor to serve as Ambassador to Palau, Ambassador Tomasik expressed his commitments to strengthen cooperation in the United Nations, the European Union, in international organizations and other areas of mutual interests. Ambassador Tomasik is the first Ambassador-designate to be accredited by President Remengesau in 2019. Visiting Palau with his wife for the first time to present his credentials, he accepted the President’s invitation to attend the 25th Independence Day celebration later this year and hopes to make more visits to Palau in the future. Slovakia also known as Slovak Republic is a landlocked country located in the heart of Europe with a population of more than 5 million population. The ceremony was witnessed by Paramount Chief Ibedul Yutaka M. Gibbons, Paramount Chief Reklai Raphael B. Ngirmang, Dirraudes Magdalena Ngirmang, Delegate Mario Gulibert, Minister Baklai Temengil-Chilton, Minister Elbuchel Sadang, Minister Faustina Rehuher-Marugg, Minister Emais Roberts, Minister Charles Obichang, Minister Sinton Soalablai, Chief of Staff Secilil Eldebechel and Deputy Chief of Staff Rebluud Kesolei. [L-R] State Minister Faustina Rehuher-Marugg, H.E. President Remengesau, Jr., Ambassador Tomasik and his wife Alexandria.